With a stay at Hostal Uria in Salamanca (Oeste), you'll be within a 10-minute drive of Plaza Mayor and University of Salamanca. This residence is 0.2 mi (0.4 km) from La Calcografía and 0.3 mi (0.5 km) from San Marcos Church. 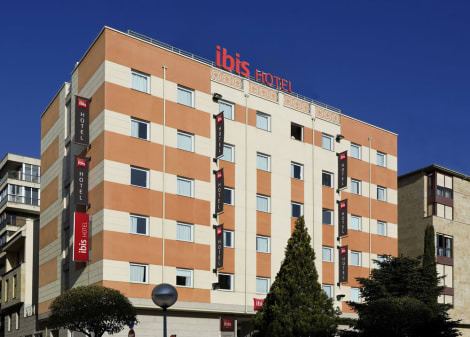 This attractive city hotel enjoys a privileged location in Salamanca Old Town, providing easy access to some of the most important tourist attractions in the area such as the cathedrals, Calixto and Melibea gardens, and the Convent of San Sebastian. Salamanca Airport is just a 15-minute drive from the hotel. Built around the ruins of San Polo church, this enchanting establishment offers a choice of tastefully decorated rooms featuring a classical design. They all combine elegance and luxury with modern conveniences and some of them also feature stunning views over the magnificent Cathedral. Those travelling on business will find a business centre and the cosy restaurant offers a warm atmosphere as well as a beautiful terrace where to chill after a busy day out discovering the city. With a stay at OYO Emperatriz II, you'll be centrally located in Salamanca, within a 5-minute walk of Plaza Mayor and University of Salamanca. This hostal is 0.1 mi (0.1 km) from Casa de las Conchas and 0.1 mi (0.1 km) from Anaya Palace. The hotel is a traditional style building constructed with Villamayor stone giving the building the traditional golden tone of the most traditional Salmantine buildings. Make yourself at home in one of the 62 air-conditioned guestrooms. Complimentary wireless Internet access is available to keep you connected. Bathrooms have shower/tub combinations and hair dryers. Housekeeping is provided daily, and irons/ironing boards can be requested. With a stay at Vincci Ciudad de Salamanca in Salamanca (Vistahermosa), you'll be a 4-minute drive from University of Salamanca and 8 minutes from Plaza Mayor. 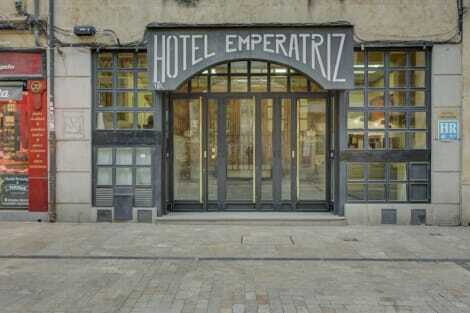 This 4-star hotel is 0.7 mi (1.2 km) from Monumento al Lazarillo de Tormes and 0.9 mi (1.5 km) from Salamanca Automobile History Museum. Make yourself at home in one of the 103 air-conditioned rooms featuring minibars and plasma televisions. Complimentary wireless Internet access keeps you connected, and digital programming is available for your entertainment. Private bathrooms with bathtubs or showers feature designer toiletries and hair dryers. Conveniences include phones, as well as safes and desks. Make yourself at home in one of the 17 air-conditioned rooms featuring iPod docking stations and LCD televisions. Your Select Comfort bed comes with premium bedding. Complimentary wired and wireless Internet access keeps you connected, and premium TV channels provides entertainment. Private bathrooms with shower/tub combinations feature jetted bathtubs and complimentary toiletries. With a stay at Hostal Escapa-T, you'll be centrally located in Salamanca, a 4-minute drive from Plaza Mayor and 9 minutes from University of Salamanca. This hostal is 0.2 mi (0.3 km) from Alamedilla Park and 0.4 mi (0.6 km) from La Calcografía. One of Spain's most handsome cities, Salamanca is famed for its well-preserved Old City, which is now on the UNESCO World Heritage Site list, along with dozens of other sites in the country . This settlement is also home to the University of Salamanca, which is one of the oldest higher education institutions in the world, founded in 1134. Salamanca has existed since the Roman period, and contains one of the highest concentrations of Renaissance buildings of any city in Europe. The Spanish spoken here is said to be the best in the country, which is why Salamanca is a particularly popular destination for learning Spanish. Dating back to the 12th century, the Old Cathedral is revered for its elaborate Romanesque architecture, although it not usually open to the public. The New Cathedral, meanwhile, was established much later, in the 16th century, although it was not completed until the 18th century. This latter building, which was built on the orders of King Ferdinand V of Castile, has magnificent Baroque- and Gothic-style architecture, and became a national monument in the 19th century. The enchanting Convento de San Esteban, one of the most architecturally impressive in Spain, was completed in the early 17th century after almost 100 years of construction, and replaced a much earlier medieval monastery. Like the Casa de las Conchas, the most intriguing feature of this building is its Plateresque-style façade, which has Italian Renaissance influences and was designed in the late-16th century. See the Casa de las Conchas, which dates back to the late 15th century and was built by Rodrigo Arias de Maldonado, who served as a professor at the university. Don't forget to spend some time in the majestic Plaza Mayor square, which is among the most famous in Spain and contains numerous elegant cafés, souvenir shops and ice cream parlours. The square, which was designed in the 18th century, was once a major centre for bullfighting, and is the centrepiece of the Salamanca's World Heritage Site. Treat yourself to some fabulous tapas at the factory gourmet restaurant, or choose the Bordadores 12 restaurant for other delightful Spanish classics. You can also enjoy some wonderful Italian recipes at the Pizzeria Mambo Italiano, tantalising seafood at El Club Nautico, or other exquisite Spanish and Vegetarian food at El Laurel. For sophisticated surroundings, choose the comforSEOSITE_LEVEL_DESCRIPTION, high-end Grand Hotel Don Gregorio, or consider booking a stay at the charming NH Salamanca Puerta de la Catedral. Other highly regarded Salamanca hotels include the TRYP Salamanca, the Eurostars Las Claras, and the Hotel Petit Palace Las Torres, although there are dozens of other accommodation establishments you can consider in the city.